Daytonian in Manhattan: The Lost Henry Marquand Mansion -- Madison Ave and 68th St. 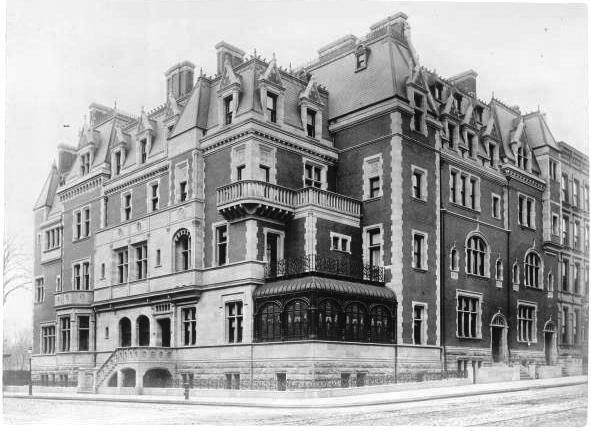 The Lost Henry Marquand Mansion -- Madison Ave and 68th St.
William Henry Vanderbilt’s bride, Alva Erskine Smith, had a love affair with things French. In 1878 when the rest of the Vanderbilt family lined Fifth Avenue with dour, if sumptuous, brownstone mansions, she began working with architect Richard Morris Hunt on a French Renaissance chateau in gleaming white limestone. The house, known as the Petite Chateau at No. 660 Fifth Avenue, would break the brownstone grip on New York’s millionaires forever. As the mansion was still under construction in 1881, Hunt was busily working on another show-stopper—the Henry G. Marquand residence. The 63-year old Marquand had retired from the jewelry business in 1839 and at the end of the Civil War entered the railroad and banking industries. Now fabulously wealthy, he needed a home large enough not only to reflect his social station, but more importantly to accommodate his extensive art collection. Eschewing the more obvious Fifth Avenue, Marquand purchased land on the corner of Madison Avenue and 68th Street large enough for his own mansion and two smaller, upscale residences. His choice of architect was expected—not only was Hunt a personal friend; he had already designed three other projects for Marquand, including Linden Gate, his summer cottage in Newport. Construction took three years and although the house was finished in 1884, it would be several more years before the interiors were completed. 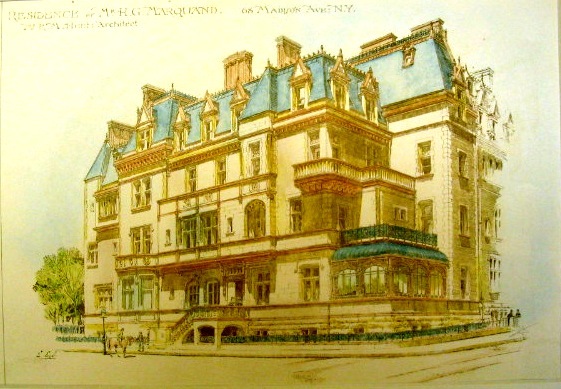 Marquand’s mansion, which cost $1 million, faced 68th Street with the two smaller houses opening on to Madison Avenue. Hunt turned to the “French transitional” style, melding elements of Renaissance and Gothic into his brick and sandstone creations. The three residences blended into a unified whole with picturesque balconies, gables, cresting and multi-level mansards. By raising the height of the Madison Avenue houses slightly above the Marquand mansion, Hunt visually eliminated the steep grade of the avenue. Visitors entered into a massive central hall that rose four stories to a glass ceiling. A split staircase led to the upper floors and galleries. The mansion was decorated in the height of Late Victorian fashion, heavily influenced by the current Aesthetic Movement. Marquand hired the most esteemed artists and decorators of the day—Frederick Leighton, Louis Comfort Tiffany, John La Farge and Lawrence Alma-Tadema—to design the furniture and interiors. The artisans created lush themed rooms: a Pompeian, Moorish, Japanese, and a Spanish style room. Perhaps the most important was the Grecian-themed room which served as the music room. British artist Alma-Tadema, well known for his paintings of ancient Greece and Rome, designed the suite of Grecian furniture. The furniture, of ebony, cedar, sandalwood and ebonized mahogany was inlaid with ivory, mother-of-pearl and brass. 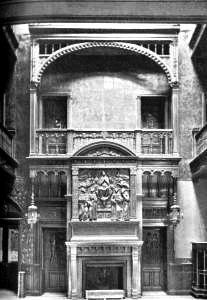 It sat in a room with marble fluted pilasters upholding a beamed ceiling with painted scenes by Sir Frederick Leighton, the president of the Royal Academy. The Japanese room took several years to finish and the decorative work cost Marquand $150,000. Asian cabinets filled with Japanese and Chinese items—porcelains, ivory carvings, pottery and lacquered pieces—sat against custom embroidered silk wall coverings. The firm of Robert Ellin & John W. Kitson masterfully carved the ceiling, overmantel, doors and frames and cabinets. Stained glass by La Farge illuminated a small niche beside the fireplace. Next to the expansive conservatory that faced Madison Avenue was the Moorish Smoking Room where, after dinners, gentlemen guests would join their host while the women retired to a more feminine sitting room. Here John La Farge had carved an elaborate over-door panel in alabaster, inset with brilliantly colored glass “in rich Persian style.” Spanish lusterware tiles from one of Philip II’s palaces were were set in the ceiling and frieze, and colored plaster in relief mimicked the walls of the Alhambra. 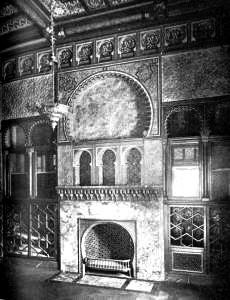 Louis C. Tiffany, who did the mosaics and glass for the central hall, was most likely involved in the decoration of the Moorish room as well. 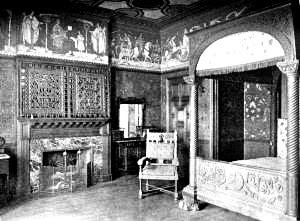 The dining room was English Renaissance and its walls were hung with late 16th century Flemish tapestries. In the main hall was a bronze fountain of a boy grappling with a goose, cast by Henry Bonnard of New York. Upstairs was the library and several bedrooms. Like the rooms below, here were ceiling paintings, stained glass and wall murals by artists like Francis Lathrop and Frederic Crowninshield. Illuminating the landing of the staircase to the third floor were stained glass windows by Eugene Stanislas Oudinot, portraying Michelangelo and da Vinci. The same artists decorated the third floor bedrooms, painting the friezes and ceilings; including one in the Byzantine style. When American art historian Bernard Berenson visited Marquand in the house in 1894 he wrote that the mansion was “tremendously luxurious and beautiful, a feast for the eyes.” The hallways and galleries of the mansion were filled with the millionaire’s dazzling collection of paintings, artwork and antiquities. Marquand owned old masters including Van Dycks, Frans Hals, Rembrandts, and Vermeers; classical Greek pottery and Chinese porcelains. The rooms in which the priceless works of art were housed were, themselves, works of art. After having sat vacant for five years Marquand finally leased the house directly behind his. His new tenant was the former President, Grover Cleveland. On May 15, 1889 The Evening World reported “Citizen Grover Cleveland has finally decided to settle down permanently in Gotham and has selected his place of future residence. "It is a fine and imposing mansion, at 816 Madison avenue, and adjoins the magnificent residence of Banker Henry G. Marquand…who will become the ex-President’s landlord.” Cleveland opted to rent the house for two years rather than buy it outright. Marquand thought, perhaps, that the price was a consideration. 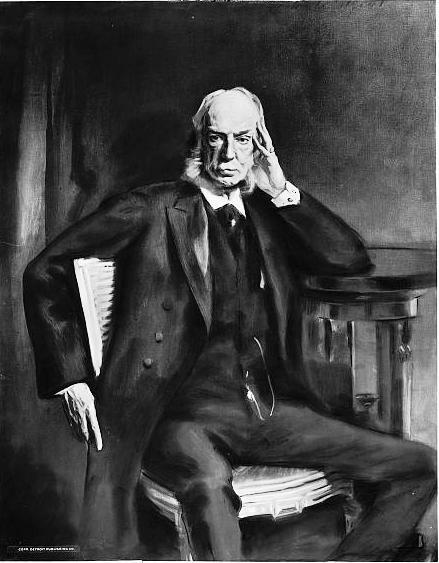 Marquand posed for a portrait by John Singer Sergeant -- Libraray of Congress. His death also brought another issue to the forefront. The Times mentioned “The death of Mr. Marquand naturally occasions much speculation as to the disposition of his private gallery.” The millionaire’s personal collection was one of the most prized in the world. On April 22, 1905 the New-York Tribune announced that the mansion would be offered at public auction five days later—“one of the costliest and finest dwelling houses ever offered to the highest bidder.” The auction came and went and the house did not sell. On May 22 architect Herbert Lucas headed a syndicate that acquired the adjoining houses at Nos. 814 and 816 Madison, both sold by daughters of Marquand. The houses would follow the Marquand mansion under the wrecking ball to make way for the apartment building. In place of the magnificent structure--whose rooms were designed by the foremost artists and designers of the day and filled with priceless paintings and artwork—the 12-story apartment building still stands . It is an attractive, well-designed early 20th century structure that, unfortunately, cannot hold a candle to the building it replaced. The piano at least survives in the Clark Art Institute in Williamstown Ma. An amazing armchair from the music room is on permanent display at the National Gallery of Victoria, in Melbourne, Australia. Am I correct in assuming that the house stood on the northwest corner of Madison Avenue and 68th Street, and that it was replaced by the building numbered 11 East 68th Street? You are correct. I added a contemporary photo this afternoon to help get one's bearings. Obviously everything west to the Park was still undeveloped. Good catch! Nice entry - but what a tragic loss. 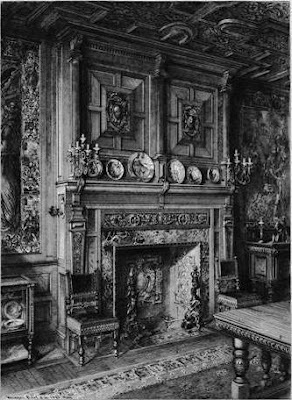 What ever became of the house's internal contents and decorative embellishments (other than the piano as noted above by @Eric Scott)...? a great deal of the art went to the Metropolitan Museum ... I have never heard what became of most of the furniture. Sad to also note that in this time period there was little secondary market for many architectural elements and interior fittings and most, if not all, with few exceptions,from many of these great houses did end up as trash and salvage. Occasional elements did get reused. A Chinese style Chandelier from the Cornelius Vanderbilt mansion ended up in Loew's State Theater in Syracuse NY (bits of it are still extant) and I think an Egyptian style room went to the Ringling Museum of Art in Florida to be used as a gallery setting. When John D. Rockefeller died in the 1930's the 1880's period rooms in his house were considered notable enough that they were saved and are now in several museums. My great grandfather was John William Kitson, one of the contractors mentioned. His brother Samuel James Kitson had been hired by Marquand to sculpt some statues for the galleries. I do not know what happened to them. Additionally Ellin & Kitson also worked on the Vanderbilt houses as did Samuel who was hired to carve many statues for Alva Vanderbilt's French mansion. Interesting. I am doing a little research on my father's home and I believe the Japanese room made its way to CT. His home was originally built by Michael Pupin for Helen Hartley Jenkins, some wealthy NYC contemporaries. They must have purchased the room from this auction. As I still believe it is so sad, and sad on our history as a country, that we are so willing to raze beautiful architectual buildings, in the "name of progress and the future". Yes many homes are still around and have been converted to apts, or stores, their "character" is long gone tho. We have been so willing to tear something down that was a large part of our histor after 50 yrs, if we even wait that long!. One of the most appealing things about Europe..you can see places that have been standing for years, centuries. But not here. having said that.... ONE of the reasons I have your web-site on my "favorites" bar... I am reading my new Arch. Digest and there is an ad on The Marguand. I read, it states "on the site of the former Henry Gurdon Marquand Mansion. SOOOO I pull you up, type in HGM mansion..and ahha there it is!! I can read about it, see it's beuty, craftsmanship, it's history! Thanks so much for this site!! Keep up the good work. I go to your site daily.!! glad you're enjoying the blog! Hope you get to New York soon. 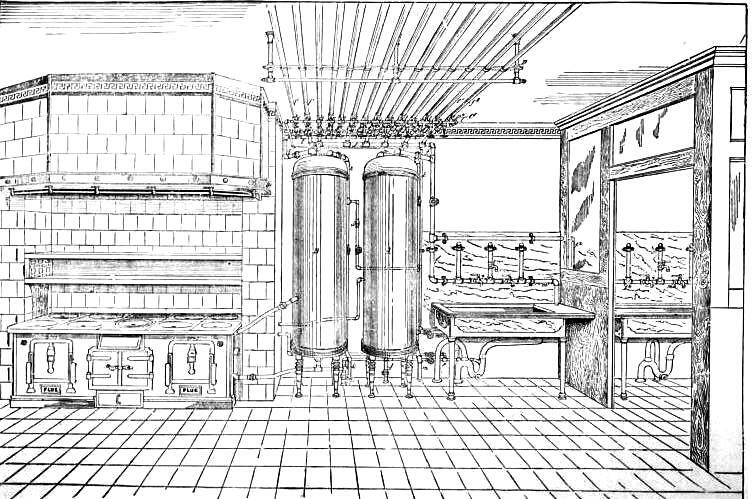 I am contributing to an online exhibit about Marquand. Is it alright if I use the illustration of the hand-colored sketch of the mansion from American Architect and state your blog as the contributor? I can only find the illustration that is not colored. Where did you find it? I would have to dig back into my research to find the source of that sketch; however I am sure you can use that, since the copyright has expired. Thanks for this partial answer to my recent question. "Am I correct in assuming that the house stood on the northwest corner of Madison Avenue and 68th Street, and that it was replaced by the building numbered 11 East 68th Street? If I'm correct as to location, it is interesting to note that there doesn't seem to be anything between the house and what I assume are the trees of Fifth avenue or central park in the distance"
the City of New York. Do you know if that's so?